Flying hot air balloons can be a very exciting hobby or profitable business. 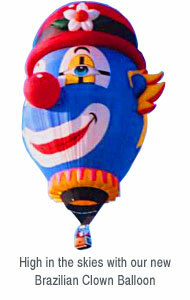 The Balloonatic Promotions can help you obtain your flying license for either application. We can help you from the ground up with ground school, preparation for the FAA written test, flight instruction time, balloon rentals, balloon sales and more. We have everything you need whether you are a first time flyer or an experienced pilot seeking your commercial license. You can earn your private license for as little as $995.00.